Earlier this week I shared a moment with my 11-year-old son that I had been waiting YEARS for. A moment that brought joy to my heart and I know will leave my own mother bursting with pride. 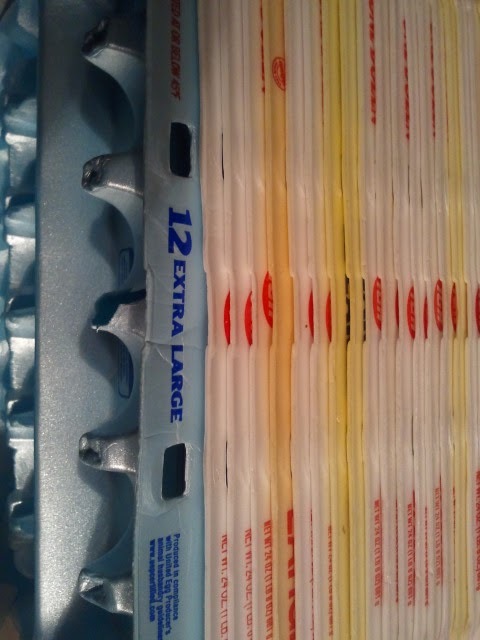 He said, my teacher wants us to bring in egg cartons. Ah, ha! I just happen to have a shopping bag full of egg cartons. Craft hoarding FOR THE WIN!! I'm so proud to be picking up where my mother left off. She ALWAYS had things on hand. Things for making a scarecrow, things for making a Halloween costume, things for every school project conceived. Do you need fabric circles, yarn, paint, glitter, ribbon, baby food containers (my baby is 6), then I am the woman for you. I'm always amazed when people say they need to go out and buy supplies for a project. Don't you already have a closet haphazardly stuffed with craft items? Oh, not everyone has that? So I'll keep saving the last few unused plates from the birthday party, pulling out the box of ribbon, sticking egg cartons in my pantry. And before I ever think about heading to Hobby Lobby, I'll stop at Mom's. I am a proud Mom.